Composed of silicate rocky material with an average thickness of 2,886 kilometres (1,793 mi), the mantle sits between the Earth’s crust and its upper core. The mantle makes up 84% of the Earth by volume, compared to 15% in the core and the remainder being taken up by the crust. While it is predominantly solid, it behaves like a viscous fluid due to the fact that temperatures are close to the melting point in this layer. Our knowledge of the upper mantle, including the tectonic plates, is derived from analyses of earthquake waves; heat flow, magnetic, and gravity studies; and laboratory experiments on rocks and minerals. Between 100 and 200 kilometers below the Earth’s surface, the temperature of the rock is near the melting point; molten rock erupted by some volcanoes originates in this region of the mantle. The mantle is divided into sections which are based upon results from seismology. These are the upper mantle, which extends from about 7 to 35 km (4.3 to 21.7 mi) from the surface down to a depth of 410 km (250 mi); the transition zone, which extends from 410 t0 660 km (250 – 410 mi); the lower mantle, which reaches from 660 km to a depth of 2,891 km (410 – 1,796 mi); and the the core-mantle boundary, which has a variable thickness (~200 km or 120 mi on average). In the upper mantle two main zones are distinguished. The innermost of these is the inner asthenosphere, which is composed of plastic flowing rock of that averages about 200 km (120 mi) in thickness. The outer zone is the lowermost part of the lithosphere, which is composed of rigid rock and is about 50 to 120 km (31 to 75 mi) thick. 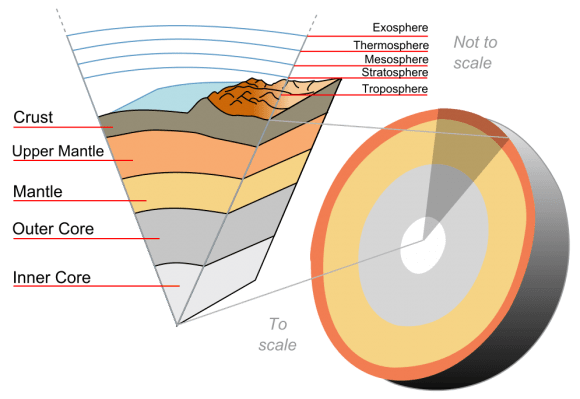 The upper part of the lithosphere is the Earth’s crust, a thin layer that is about 5 to 75 km (3.1 to 46.6 mi) thick, which is separated from the mantle by the Mohorovicic discontinuity (or “Moho”, which is defined by a sharp increase downward in the speed of earthquake waves). In some places under the ocean, the mantle is actually exposed. There are also a few places on land where mantle rock has been pushed to the surface by tectonic activity, most notably the Tablelands region of Gros Morne National Park in Newfoundland and Labrador, Canada, St. John’s Island, Egypt, or the island of Zabargad in the Red Sea. In terms of its constituent elements, the mantle is made up of 44.8% oxygen, 21.5% silicon, and 22.8% magnesium. There’s also iron, aluminum, calcium, sodium, and potassium. These elements are all bound together in the form of silicate rocks, all of which take the form of oxides. The most common is Silicon dioxide (SiO2) at 48%, followed by Magnesium Oxide (MgO) at 37.8%. Examples of rocks that you might find inside the mantle include: olivine, pyroxenes, spinel, and garnet. Because of the temperature difference between the Earth’s surface and outer core, there is a convective material circulation in the mantle. This consists of the slow, creeping motion of the Earth’s silicate mantle across the surface, carrying heat from the interior of the Earth to the surface. Whereas hot material rises to the surface, cooler, heavier material sinks beneath. The lithosphere is divided into a number of plates that are continuously being created and consumed at their opposite plate boundaries. Downward motion of material occurs in subduction zones, locations at convergent plate boundaries where one mantle layer moves under another. Accretion occurs as material is added to the growing edges of a plate, associated with seafloor spreading. This chaotic process is believed to be an integral part of the motion of plates, which in turn gives rise to continental drift. Subducted oceanic crust is also what gives rise to volcanism, as demonstrated by the Pacific Ring of Fire. Scientific investigations and exploration of the mantle is generally conducted on the seabed due to the relative thickness of the oceanic crust compared to the continental crust. The first attempt at mantle exploration (known as Project Mohole) achieved a deepest penetration of approximately 180 meters (590 feet). It was abandoned in 1966 after repeated failures and cost over-runs. In 2005, the ocean drilling vessel JOIDES Resolution achieved a borehole that was 1,416 meters (4,646 ft) in depth below the sea floor. In 2007, a team of scientists aboard the UK research ship RRS James Cook conducted a study on an exposed section of mantle located between the Cape Verdr Islands and the Caribbean Sea. In recent years, a method of exploring the Earth’s layers was proposed using a small, dense, heat-generating probe. This would melt its way through the crust and mantle and communicate via acoustic signals generated by its penetration of the rocks. The probe would consist of an outer shell of tungsten with a core of cobalt-60, which acts as a radioactive heat source. It was calculated that such a probe will reach the oceanic Moho in less than 6 months and attain minimum depths of well over 100 km (62 mi) in a few decades beneath both oceanic and continental lithosphere. In 2009, a supercomputer application created a simulation that provided new insight into the distribution of mineral deposits from when the mantle developed 4.5 billion years ago. While the Earth’s mantle has yet to be explored at any significant depth, much has been learned from indirect studies over the past few centuries. As human exploration of the Solar System continues, we are sure to learn more about terrestrial planets, their geological behavior, and their formation. We have written many articles about the Earth’s interior here at Universe Today. 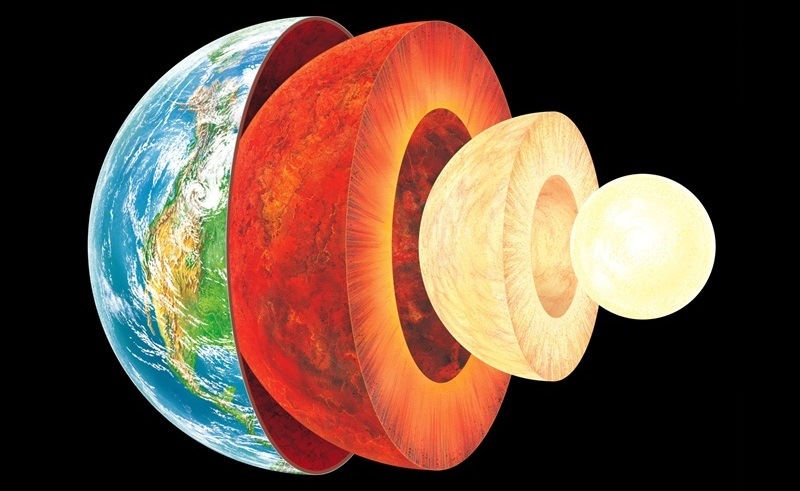 Here’s one about the Earth’s Mantle, Discovery of the Earth’s Inner, Inner Core, What Is The Difference Between Magma And Lava, and an article about how the Earth’s Core Rotates Faster Than Its Crust. For more information, check out the United States Geological Survey (USGS). Astronomy Cast also has an episodes on the subject. Listen to it here, Episode 51: Earth. So, if asked to describe the earth in a few words, would molten ball of rock be the most accurate? Also could the proposed melt probe also be used to explore Europa?